Though one might point at the earth and miss it, though one might bind up the sky, though the tides might cease to ebb and flow and the sun rise in the west, it could never come about that the prayers of the practitioner of the Lotus Sutra would go unanswered. I went to a Buddhist discussion meeting last night and one of our members offered this Gosho passage as one of their favourites. I was moved to tears because I had chosen this passage when I told my experience of bringing my son home. After 7 long years of trying to have a baby and waiting 2 years to adopt, I had had many doubts as to the strength of my faith, my marriage and my mental health. I had spent everything I had to have a child, the down payment for a house was gone and then when we moved on to the adoption, even that journey was nothing I had ever imagined. I had become a woman that I did not recognize anymore. Years before, a woman was doing a healing massage on me and told me that a child may come to me but not through me. I was a ball of grief but those words never left me. And then the night I held my son perhaps for the last time, I chanted for him and his mother to be happy and I knew that I could survive anything after having my heart just about ripped from my chest. His happiness was all that mattered, not mine. And then my prayers were answered. DH has been away for 5 days taking care of his parents on the island. His dad got sick last week and what started as a bad cough quickly turned into pneumonia and he had to go to the hospital. My father-in-law was dealing with polymyalgia and now has Type 2 diabetes, so that will be a additional health challenge to manage. My dear MIL became quite run down and stressed out. Her best friend was out of town and as she does not drive, she was relying on neighbours, so I’m glad hubby was able to go and take care of things. He’s great at that, I know firsthand. He’s fantastic in a crisis. I gave hubby my Magic bullet blender and some healthy diatetic smoothie recipes to take with him (his dad dropped a lot of weight) and he was getting all agitated with me for making things “complicated”. He has this lovely knack of downplaying health problems unless it’s his own. He’s never ever been really sick (the one time he thought he was having a heart attack; it was a PANIC attack and he’s never let me forget he had to drive himself to the hospital, which he insisted he do because I had to mind the kid). I think he was really worried himself, but he’d never admit it. It’s not easy to see your parents get older and weaker, they are no longer the invincible people you knew them to be. It’s hard to see them crying and vulnerable and they are relying on YOU, not the other way around. I did pretty good on my own with Boo but by Sunday I was going a little crazy and had to stop myself from texting every mother I knew to come take my kid for a bit. Okay, I did send out one text but the mum later told me that both her and her husband were sick, and she didn’t get my message early enough. I lived. I was trying to study for a Buddhist exam and Boo wasn’t giving me much breathing space, but it all worked out and I ended up taking him to the evening meeting so I could do the exam. He was golden of course. With that accomplished, I felt great! I stole her kid away the next day for a very long walk with Boo and the dog. Everyone got their exercise! Bad health news is going around these days and we’re at that magical age where we’re dealing with the increasing needs aging parents and growing children. A lot of women my age have full grown kids, but mine is just five years old so the needs on both ends are fairly high. It’s an interesting place to be, I tell you. I met someone who was childless not by choice. You know how some people just gush over their friend’s kids and want to know all the details of their lives and others just kind of stand back and look at them and just smile? She was the latter. I kind of got that. When I was in the throes of infertility, I always felt a little awkward around children. It’s not that I disliked them, I just never had any real experience with them. A parent’s life was not relevant to me in any real way. My life was simply different. I never really knew I was going to be a parent, so why immerse myself in that world. I wanted to hold a baby, but inevitably, I would be asked when I was going to have one, and then I’d fake a smile to hide the sadness at being left out of that whole female experience so it was just easier to stand back and smile. Eventually, I did get to a good place where it was okay for me to be around babies and enjoy their preciousness. This woman was about 10 years older than me, and I thought, wow, that sadness just never goes away. She may have led an incredibly satisfying life, but still that grief lingered. I guess I knew that in my heart, but when I saw it in this woman’s eyes, it just reminded me that infertility is not something you just “get over”. What I saw and felt, lasted a few moments before we went on to talk about other things, yet I never forgot that moment. Infertility impacts lives forever. 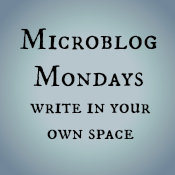 Microblog Monday – And so it begins…. As for New Year’s resolutions, I haven’t really made any – well, the usual, lose weight, be a better person, blah, blah, blah. I kinda told myself to stop complaining. I know what it’s like being henpecked, and I can’t stand it so I shouldn’t start it, right? Hubby is home f/t now, no immediate contracts on the horizon, and I have to admit, it’s hard work not complaining. From the way he keeps leaving the dishtowels on the fridge door instead of the oven door, to watching him clean up raw meat juice with the kitchen sponge (why don’t you just say you want to make us all violently ill) and then not even bothering to empty the dishwasher even though he’s been home all day and I’ve been laundry, taking the kid to school, walking the dog, and doing the grocery shopping. I know he’s been “working”, but playing games on your tablet doesn’t really count, does it? So instead of complaining I told him I couldn’t get the dishwasher open so he comes over and the rack slides out just fine and then I mildly suggest that while he’s there, he might as well empty it. I’m not going to make it to Friday, am I?